since I'm painting a couple of Rhinos at the moment I stumbled over the question with which kind of tactical marking I should decorate the shoulder pads of their crew. On one pad I already put the cog but what comes on the other one? I’m assuming for rhinos their markings would match that of the squad they are part of? It’s an interesting thought, one that I’ve not seen asked before! I’ll have a dig through all my books and see if I can find anything more concrete for you! One of those areas that has always been a bit fuzzy; so beyond saying that it varies from Chapter to Chapter (and by time period), there's not a lot of info. 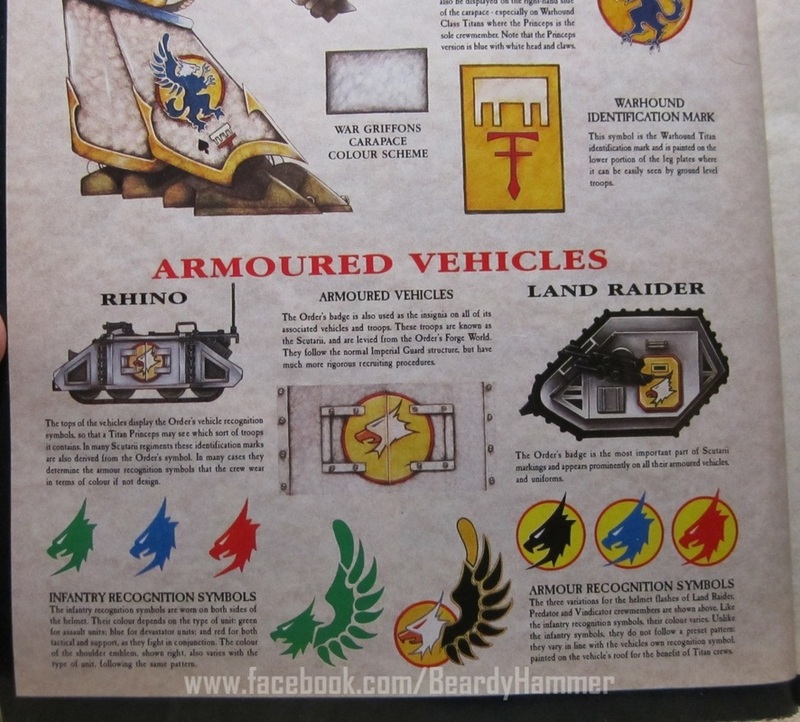 My suggestion, based on some musings here, would be that in a Codex Chapter, Rhinos are typically crewed by marines from the Reserve company accompanying the force. For that reason, I'd use whatever your Reserve Company markings are. Orange, purple, grey or blue trim for Ultramarines, for example. Since all Marines are capable of driving Rhinos, it wouldn't matter whether you use Assault, Devastator or Tactical markings – in fact, it would probably make for a fun change of pace. Edited by Apologist, 10 August 2018 - 10:59 AM. For chapter marines it is easier, but since we talk Heresy there are no chapters. Or no chapters in the 40k sense of things. But your second remark seems promising. Maybe it is all about from where those crewmen are drawn? For instance if it is a flier maybe storm section markings should be appropiate? My apologies – I missed that this was in the Age of Darkness section. I think much of the thinking would apply to Legion warfare, too; though given the size and scale of Legions, it's entirely possible that some Legions would have dedicated crew for their vehicles. We have some established background for dedicated armoured corps – the Dark Angels Ironwing; the title Spear of Macragge from the XIIIth etc. – so you might create some icons/markings specific to the Legion you're after. I usually have legion iconography on one shoulder pad and the cog on the other one. You can always add some small numbers on the corners of the shoulder pad to mirror the ones on the vehicle and/or squad.